A Desperate Tatter: Last one for today. I finished this snowflake that I started this morning. What a job! 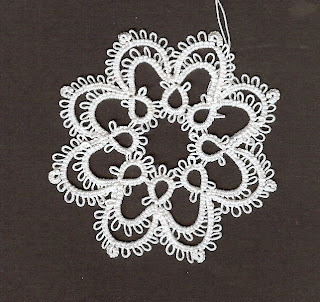 Between tatting and letting the dog out I was busy all day. I am just glad to have one more finished. One more for the window. I think I will give my fingers a rest and do something different. I have two sewing projects lined up that need to be completed before the 20th so I had better get on the ball with them.